Mixing problems are fun little logic puzzles with a deceptively easy solution, but one that could take the overthinker a while to figure out. Plus you can make the puzzle overly descriptive, throw in a few misdirection hints, and the whole thing becomes a little confusing and harder to solve. Perfect for a trickster or similar character the party might encounter for example. 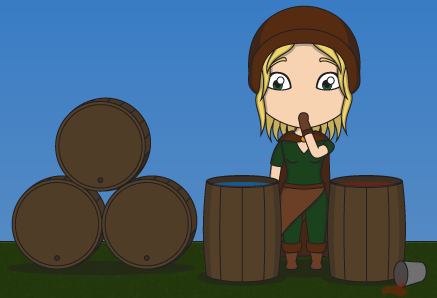 The puzzle is as follows: The party is faced with two barrels. One contains wine, the other water. One cup of wine is taken from the wine barrel, added to the water barrel, and a cup of this wine/water mixture is then taken out, and put into the wine barrel. Which one of the two mixtures is purer? I will give you time to figure it out by making this sentence overly long in order not to reveal the answer in the first part of the sentence, as that would spoil things. But the answer is that both mixtures are equally pure. Consider that you have a barrel of 1000 red marbles, and a barrel of 1000 blue marbles instead of wine and water. You take out a cup of the red (let's say a cup is 50 marbles), you add those to the blue. You then take out a mixture of the blue/red marbles, again 50 in total, and add it to the red. Since the quantities you take out are equal there will always be an equal amount of red and blue marbles in each barrel, just in reverse. Say you scoop out a mixture of 30 red, and 20 blue marbles during the second scoop. This means the originally red barrel will now be a mixture of 980 red marbles, and 20 blue ones. The originally blue mixture will be left with 980 blue marbles, and 20 red ones. 1000 blue + 50 reds (first scoop) - 30 red and 20 blue (second scoop) = 980 blue and 20 reds. 950 reds (after first scoop) + 30 reds and 20 blue (second scoop) = 980 reds and 20 blue. As mentioned you can make the puzzle appear to be way more difficult. Throw in unnecessary and different measurements (first scoop is a liter, the second 10 deciliters), add unnecessary details to the description (the mixture is then stirred for a minute before taking out 10 deciliters), play around with the colors (the mixture is stirred for a minute until it becomes a light pink, 10 deciliters of this mixture is then taken out), and so on. The savvy puzzler will see through your smoke and mirrors, but it is in this playful messing around with the details that character and role play can come into play. Just make sure the volumes you take out in both scoops are identical or the puzzle no longer works.